Preparing irresistible chips starts, of course, with the potatoes – preferably russets. As The Cooking Dish pointed out, this starchy, brown variety serves well whether fried, baked or mashed. You need to slice the potatoes very thinly, so use a sharp knife or a mandoline slicer. While the slicer is highly effective at producing pieces of just the right thickness, the Orlando Sentinel emphasized that you should be careful while using this tool. Cut the potatoes into pieces first so they’ll be easier to handle. Use a hand guard and take your time to avoid injury. For most potato chip enthusiasts, deep-frying is the way to go. Alton Brown’s recipe, for instance, calls for heating two quarts of olive oil to 300 degrees Fahrenheit in a Dutch oven. The chips go into the oil in batches, each cooking for three to four minutes. However, you can also just bake the chips and still get delicious results. Epicurious suggested heating the oven to 400 degrees while tossing the potato slices in a bowl with oil. Add salt and place the chips on a baking sheet. After 12 to 15 minutes in the oven, they’ll be ready to go. 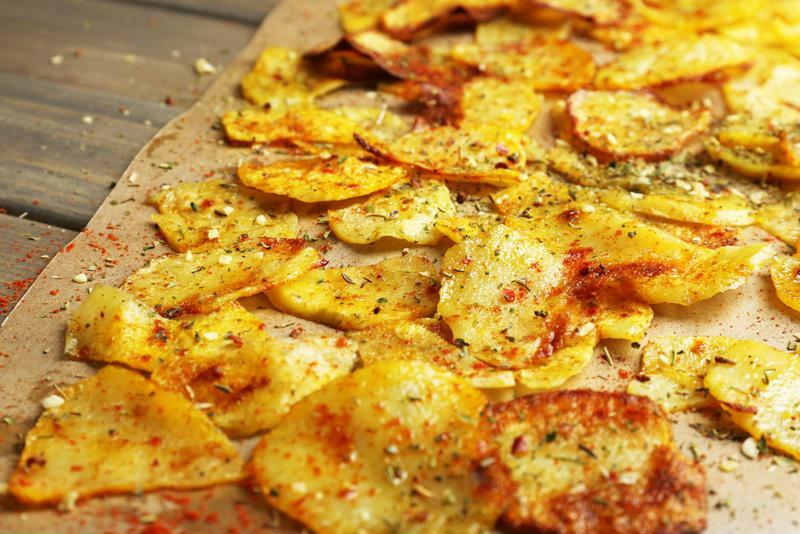 Experiment with different seasonings on your potato chips. Whatever preparation method you use, it’s essential to achieve the right degree of crispiness. If you’re someone who prefers extra-crunchy chips, Serious Eats offered some guidance to ensure you get the perfect texture every time. This method involves the preliminary step of of boiling the potato slices in a mixture of white wine vinegar and water for three minutes to eliminate the starchiness. That extra bit of cooking makes it possible for the chips to absorb more of the hot oil and thus become crunchier. The right flavorful additions after cooking the chips make a big difference in the final product. You can keep them simple and classic by just throwing on some kosher salt. On the other hand, you can get adventurous by making your own seasoning mix. Wired presented a recipe for barbecue chips from cookbook author Casey Barber. It calls for light brown sugar, smoked paprika, black pepper, and chili, onion and garlic powder. The Food Network’s Jeff Mauro, on the other hand, suggested a sour cream and onion flavor made with buttermilk, garlic and onion power, plus sugar and fresh dill. When you make potato chips, there are plenty of chances to make them your own. By drawing on what you learn from online cooking school, you can be sure they’ll come out irresistible.